The Scottish Borders somehow make it very easy to forget the turmoil and violence of its past. The countryside is lush, the hills softly roll between the market towns, and little old ladies in twinsets and pearls can still find soup and pudding lunches, and teashops that ‘do a good scone.’ Ruins are lovingly tended in their decay, their well-kept lawns, guided pathways, safety barriers and polished, informative plaques do much to further stifle any emotional connection or response to the centuries of sacking, slaughter, and burning, the heat and chaos that marked the Scottish wars of independence. Dryburgh Abbey, venue for Summerhall’s site specific hosting of Dudendance’s Borderlands is the resting place of Sir Walter Scott. It is also the resting place of Earl Douglas Haig, the controversial British commander who ordered the Somme offensive which brought about the deaths of 20,000 British soldiers in its first day. The detail quietly underscores that the process and consequence of warfare is far from merely historic. Borderlands performs the balancing act of seeking to speak directly to the brutality and bloodshed that brought about both the building and subsequent destruction of the Borders’ numerous abbeys, while doing so in a style that acknowledges and accepts the contemporary tranquillity that tends to mark these locations. Twelve white, silent, figures, arranged strategically across the site, proceed slowly through cycles of scripted movement. Their ghostly flags crackle in the wind as they invoke armoured standard bearers primed for battle. But all too soon the cycle progresses and the figures slowly fall. Their armour softens. The figures become weakened mourners draped over headstones. Momentarily still they themselves become stone. Then they begin the process of rising again, wandering ghostlike among the torn walls and archways, looking, it seems, to recover some cause for action. Heather MacCrimmon has developed an ingeneously effective costume solution here that allows figures to present as male or female, flesh or stone, dressed or armoured, depending only upon the context of the performers movement. Moments arise where the figures fall into alignment and the stones of the abbey, it seems, begin to sing. Hidden in the shadows, the Andante Chamber Choir begin the Requiem Mass by Tomas Luis de Victoria while figures ascend from the abbey crypt. 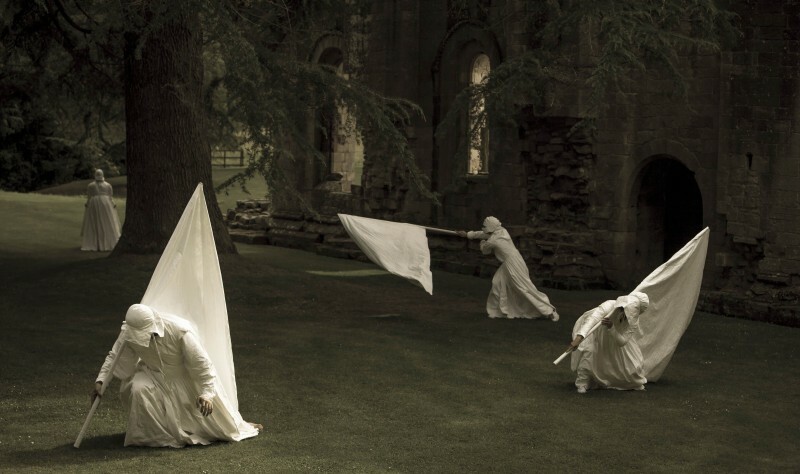 It all, fleetingly, becomes a formal theatrical presentation on a grand scale, with small episodes occurring on the grass before us, among the trees behind the abbey wall, off to the stream to the right, and above the makeshift proscenium suggested by the crumbling arches and pillars. And then, just as soon, the elements disperse and we are, to some extent, left to proceed very much in the manner of the costumed figures: proceeding slowly through the space with little indication as to what comes next. There were two ways to experience this most curious of productions. One could have been a visitor to the abbey who chanced upon the spectacle, or one could have been one of the ticketed festival-goers who had assembled at Summerhall to be escorted by bus to the site. And it is here that there was a problem. Clea Wallis directed the performers, choir, and media elements with a sensitive restraint and empathy for the location. She was, however, unable – through no fault of her own – to direct her audience, who seemed more interested in holding up their iPads to take endless pictures, stand where they were asked not to stand, and make loud vocal inquiries about the return time for the bus. It remains a mystery to me why, when placed into an evocative location on a stunning afternoon and faced with a thoughtful spectacle that somehow bridged landscape, sculpture, and performance, and that asked only that you take time out of your day to pause, reflect, and meditate on the history and form of these landscape elements… why you would choose to do so via the cracked screen of your iPad, or your camera viewfinder. It did occur to me as I watched three unrelated audience members simultaneously flick through the galleries of their hand-held devices to immediately upload pics to their Facebook, Twitter, and Instagram accounts, that they were, in fact, less present, less real, than the ghostly flag bearers and widows. Frustrating, depressing even, as this aspect was to the day, it is the cameo moments themselves, the sounds of a hidden choir, and the alignment of stone, figure, and landscape, always bound to each other, endlessly falling, endlessly struggling towards uprising that remains. A curious dream for sure. Michael Begg is a musician and sound artist based in East Lothian, Scotland, from where he runs his label, Omnempathy, and studio, Captains Quarters. He collaborates regularly on theatre sound design, most notably in an ongoing relationship with with Moscow’s blackSKYwhite, and writes regularly on sound and theatre. This written work has appeared in The Scotsman, The Quietus, Paraphilia, Sound On Sound, Adverse Effect, and in translation for the Polish Soundscape Institute.